In a gene therapy experiment that delivered glutamic acid decarboxylase into the subthalamic nucleus of Parkinson's disease patients, researchers observed on neuroimaging scans that new linkages were formed between the basal ganglia and the cortical premotor and motor regions. They also observed that study participants who expressed the network more had better clinical outcomes than did those who had lower levels of induced network expression. Patients treated with gene therapy for Parkinson's disease (PD) express a distinct metabolic brain network, with new nodal connections different from those seen in patients receiving sham therapy, according to new findings published online first November 28 in Science Translational Medicine. Gene therapy for Parkinson's disease has shown some modest promise in early clinical trials. In a phase 2 clinical trial in which glutamic acid decarboxylase (GAD) was delivered via an adeno-associated viral vector (AAV) into the subthalamic nucleus (STN), 16 participants who received gene therapy had significantly better motor control after six months than did 21 controls who underwent sham surgery, according to a 2017 report in the Journal of Clinical Investigation Insight. Motor scores on the Unified Parkinson's Disease Rating Scale improved in the control group by about four points (12.7 percent) over six months, while the treatment group improved by eight points (23.1 percent) over the same period. The improvements persisted at a one-year open-label follow-up. But the modest functional benefits, about 25 percent, were no better than deep brain stimulation and were not considered significant enough to pursue further development. Now, however, neuroscientist David Eidelberg, MD, professor and head of the Feinstein Center for Neurosciences at the Feinstein Institute for Medical Research and professor of molecular medicine and neurology at the Donald and Barbara Zucker School of Medicine at Hofstra/Northwell on Long Island, and colleagues have identified a novel mechanism underlying the gene therapy patients' improvements that could give this treatment a renewed chance. The trial's investigators had theorized that STN AAV2-GAD therapy might modulate the activity of the PD-related covariance pattern (PDRP), a disease-specific metabolic network that has been demonstrated to be an objective and specific indicator of progression in Parkinson's disease that correlates with functional measures. A 2017 study in Human Brain Mapping had demonstrated that medication and deep brain stimulation both suppress PDRP activity, in direct proportion to the motor benefit achieved. But when Dr. Eidelberg decided to take another look at FDG-PET metabolic brain imaging data obtained from the trial's subjects, he found that neither gene therapy nor sham surgery had any effect on the PDRP network at all. To identify patterns in the scans, taken presurgery, at six months after surgery, and again at 12 months, he used a computational method known as ordinal trends/canonical variates (OrT/CBA), a form of supervised principal components analysis (PCA), in which scans from each subject were ordered by time point. This multivariate approach is designed to detect spatial covariance patterns (networks) for which subject expression scores consistently change across time and/or treatment states. The investigators studied the sham network first and found it was associated with the expression of a distinct cerebello-limbic circuit, a different brain region from either PDRP or what they ultimately found to be involved with the gene therapy in a 2014 report in the Journal of Clinical Investigation. They next applied the OrT/CVA computational methods on the gene therapy patients, where they found a unique network far different from either PDRP or the network activated in sham therapy patients. They called it the AAV2-GAD-related metabolic covariance pattern (GADRP). “It wasn't seen at baseline and evolved over time strictly in the gene therapy patients, a remodeling of network connections that we believe allowed the rest of the brain, in the motor system at least, to adapt and take on a different network feature than what would have otherwise occurred,” said Dr. Eidelberg. These new connections improved linkages between regions in the basal ganglia and the cortical premotor and motor regions. They recruited nearby nonmotor pathways to connect the left superior frontal node to the left caudate nucleus, the right superior frontal node to the right supramarginal gyrus in the parietal lobe, and the left anterior putamen and globus pallidus to the ipsalateral thalamic node. Gene therapy patients also had increased metabolic activity in the premotor region and supramarginal gyrus, and decreased activity in the basal ganglia, the ventral anterior and medial dorsal thalamic nuclei, and the inferior frontal gyrus. “We found that this network ultimately allowed the site of the gene therapy and the subthalamic nucleus to connect and get signaling to the motor cortex. Indeed, we found that people who expressed the network more had better clinical outcomes than did those who had lower levels of induced network expression,” said Dr. Eidelberg. •. Niethammer M, Tang CC, Vo A, et al Gene therapy reduces Parkinson's disease symptoms by reorganizing functional brain connectivity http://stm.sciencemag.org/content/10/469/eaau0713/. Sci Transl Med 2018; 10(4469).pii:eaau0713. •. Niethammer M, Tang CC, LeWitt PA, et al Long-term follow-up of a randomized AAV2-GAD gene therapy trial for Parkinson's disease https://insight.jci.org/articles/view/90133. JCI Insight 2017:2(7):e90133. •. Vo A, Sako W, Fujita K, et al Parkinson's disease-related network topographies characterized with resting state functional MRI https://onlinelibrary.wiley.com/doi/full/10.1002/hbm.23260. Human Brain Mapp 2017; 38(2):617–630. •. Ko JH, Feigin A, Mattis PJ, et al Network modulation following sham surgery to Parkinson's disease https://www.jci.org/articles/view/75073. J Clin Invest 2014; 124(8): 3656–3666. 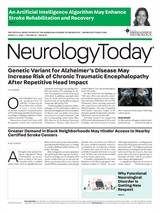 Neurology Today19(3):9-10, February 7, 2019.